Combined Insurance K9 'Rhett' displayed at 40 E Grand in Chicago, Ill.
CHICAGO, Aug. 20, 2018 /PRNewswire/ -- Combined Insurance participated in the Chicago K9s for Cops public art campaign by sponsoring a K9 display in the Magnificent Mile District in partnership with the Chicago Police Memorial Foundation. The initiative serves to memorialize Chicago's heroic fallen officers while supporting the families of police officers killed or catastrophically injured in the line of duty. 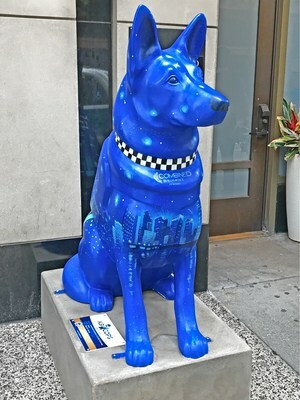 The display of 50 hand-painted police K9s will be posted along the Magnificent Mile through Sept. 30. A leading provider of individual and group supplemental accident & health, disability, and life insurance products, and a Chubb company, Combined Insurance was founded in Chicago over 95 years ago by W. Clement Stone. The Combined Insurance K9 pays homage to its founder by showcasing one of his memorable quotes: "Aim for the moon. If you miss, you may hit a star." "It's an honor to partner this year with the Chicago Police Memorial Foundation and participate in the K9s for Cops campaign," said Kevin Goulding, Combined Insurance President. "We are proud to support the families of the men and women who dedicate themselves to serving and protecting the Chicago community." Established in 2004, the Chicago Police Memorial Foundation strengthens the relationship between the Chicago Police, its business and civic leaders and its citizenry. It allows the community to express gratitude to the fallen and injured officers' families for the ultimate sacrifice. The inspiration behind the name for the Combined Insurance K9, "Rhett," came from Rhett Jacobs, Account Executive, at Combined Insurance. "When I heard of the Chicago K9s for Cops public art campaign, I presented the idea of sponsoring a German Shepherd to Combined Insurance President, Kevin Goulding," said Rhett Jacobs. "At Combined, we are fortunate to have a leader that believes in the freedom of expression and gives back to the families of law enforcement in the local community. Seeing the K9 displayed on the Magnificent Mile is a dream that became a reality, and I am honored to take part in this experience." To learn more, visit the company's website at combinedinsurance.com. Combined Insurance Company of America (Chicago, Ill.) is a leading provider of individual supplemental accident & health, disability, and life insurance products and a Chubb company. With a tradition of nearly 100 years of success, Combined Insurance is committed to making the world of supplemental insurance easy to understand. The company has an A+ rating by the Better Business Bureau and is one of Ward's Top 50® Performing Life-Health Insurance Companies. Combined Insurance is ranked the number one Military Friendly® Employer in the over $1B revenue category for 2019 by VIQTORY. This is the company's eighth consecutive year on the top 10 list and fifth consecutive year in the top 5—Combined Insurance was previously named the number one Military Friendly® Employer in the nation for 2015 and 2016. For more information, please visit combinedinsurance.com.